At Doyle's 'Asian Works of Art' auction on Monday, March 13, a Chinese Doucai glazed porcelain cup, estimated at $50,000-70,000, achieved a staggering $2 million following competitive bidding. Read more about it here. At Bonhams' auction of 'Fine Chinese Snuff Bottles' on Monday, March 13, this inside painted glass snuff bottle— signed Ding Erzhong and dated 1897—sold for $45,000. View more information here. This imperial gilt bronze ritual 'ruibin' bell (Qianlong mark and of the period) sold for $607,500 at Bonhams' auction of 'Chinese Works of Art and Paintings' on Monday, March 13. More info here. Bonhams finished out the day on Monday with their sale of 'Indian, Himalayan & Southeast Asian Art,' during which gilt copper alloy figure of Tara, from 15th-century Tibet, achieved $487,500. View more details about the object here. This group of six Sakya lamdre lineage masters from Tibet, circa 15th century, sold for $727,500 at Bonhams' evening sale on Tuesday, March 14, titled 'Portraits of the Masters.' Many other figures from this auction achieved high prices. More details here. On Wednesday, March 15, Sotheby's sold this bronze figure of Buddha Shakyamuni for $432,500 during its auction of 'Indian, Himalayan & Southeast Asian Works of Art Including Property from the Cleveland Museum of Art.' Read more about the figure here. This sandalwood scepter from 18th-century China (Qing Dynasty) sold for $90,000 during Bonhams' 'Zuiun Collection' auction on Wednesday morning. Read more about the object here. During the Christie's sale of 'Fine Chinese Paintings,' also on Wednesday, this Ming Dynasty painting titled Children and Knick-Knack Peddlar, estimated at $30,000-50,000, achieved $223,500. More details here. Part IV of the 'Ruth and Carl Barron Collection of Fine Chinese Snuff Bottles' at Christie's saw this inscribed white jade snuff bottle from Beijing's Palace Workshops go for $40,000. It was originally estimated at $4,000-6,000. More details here. Back at Sotheby's for the auction titled 'Ming: The Intervention of Imperial Taste,' this Meiping vase with tianbai ('sweet white') glaze topped the charts, selling for over $3.1 million. Read more about the vase here. At Sotheby's 'Important Chinese Art' auction, this tea bowl from the Southern Song Dynasty fetched over $1 million, over double the low estimate. Further details here. Meanwhile, at Bonhams' 'Fine Japanese and Korean Art' auction, a screen from the Edo Period showing poppies in bloom sold for $427,500. View more details by clicking here. Bonhams finished out the afternoon on Wednesday with an auction titled 'The Korean Aesthetic: The Collection of Robert W. Moore.' This ten-panel map screen of Korea from the Joseon Dynasty sold for its high estimate of $50,000. More information here. Wednesday afternoon also included Christie's sale of Indian, Himalayan & Southeast Asian Art, during which this black stone figure of Lokanatha Avalokiteshvara from 12th-century India sold for over $24.5 million. Learn more about this important sculpture here. Christie's closed out the day on Wednesday with an evening sale of 'Important Chinese Art from the Fujita Museum,' during which several bronze works of art from the Late Shang Dynasty achieved multi-million dollar results. 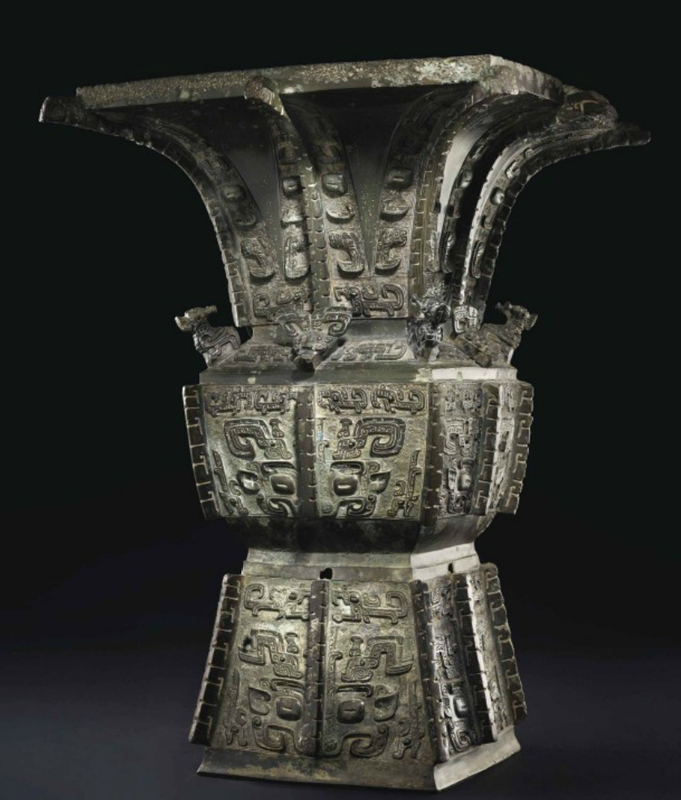 This bronze ritual wine vessel, Fangzun, sold for $37.2 million. View more information about the vessel here. On Thursday, March 16, this painting by Zhu Da titled Flowers, Birds, Fish and Fruit achieved over $3.1 million at Sotheby's auction of 'Fine Classical Chinese Paintings & Calligraphy.' View more details here. During Sotheby's 'Modern & Contemporary South Asian Art' auction, this untitled oil on canvas by Raja Ravi Varma (1848-1906) sold for nearly $1.7 million, more than twice the high estimate. View more information here. On Thursday morning at Christie's, during the auction of 'The Marie Theresa L. Virata Collection of Asian Art: A Family Legacy,' this Huanghuali circular incense stand sold for an astounding $5.8 million. Have a closer look at the object here. At Christie's sale of important early Chinese art from the Harris collection, this gilt bronze feline-form ornament from the 1st-2nd century AD sold for nearly $120,000 against an estimate of $15,000-25,000. More details here. On Friday, March 17, Christie's held its sale of 'Fine Chinese Ceramics and Works of Art.' This Junyao flower-form brush washer, from the Northern Song-Jing Dynasty, was estimated at $12,000-$18,000 but sold for over $900,000. Read more about it here. The last auction of the week, 'Saturday at Sotheby's: Asian Art,' brought in nearly $4.5 million. This handscroll, attributed to Dong Gao, was estimated at only $2,000-4,000, but sold for $348,500. Read more about it here.